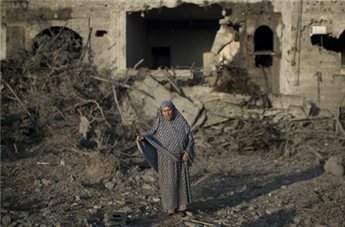 The death toll on Wednesday rose to four as Israeli airstrikes on central Gaza killed three people, among them an elderly woman, a health ministry spokesman said. The lethal strikes brought the death toll for Israel’s latest air offensive on Gaza up to 28, most of them civilians. Earlier, a Palestinian man was killed and another was injured by an Israeli airstrike on a motorcycle in the northern Gaza Strip. Israeli airstrikes killed 24 Palestinians, most of them civilians, on Tuesday in Gaza. The strikes have also injured over 100. Israel has dubbed its air campaign on Gaza “Operation Protective Edge,” saying the offensive comes in response to heavy rocket fire from Gaza’s militant groups.